on Saturday 23’rd of May 2015. There were many dignitaries in attendance that wanted to feel part of an historic event that several years ago seemed a pipe dream. The day started with a gathering of the helpers and fundraisers who over the past few years dedicated their lives to helping to see this a reality. Guest were met by Dee Kinnane and her team. There was a tremendous effort by a lot of people to have it looking so well. 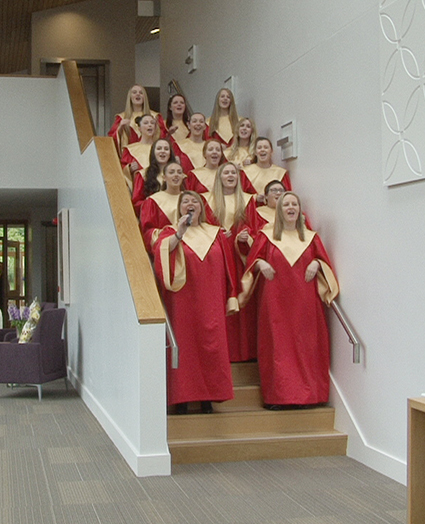 The Halleluiah Gospel Choir helped with the music and sounded fantastic. Fran Quigley from CAVS done all the sound and audio visual and did a great job as always. 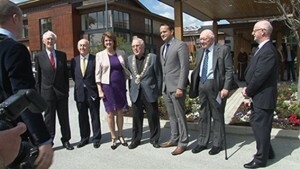 It was a great honour to be there on the day and see all the hard work coming together at the opening. I was the official wedding videographer at the wedding of Rossanna and Michael on the 12’th April 2014. 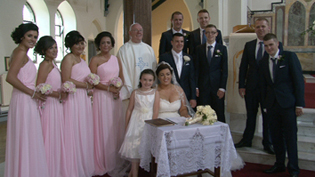 They were married in a lovely ceremony in St Patrick’s Church in Celbridge. I started filming at Rosanna’s house with Deirdre, Therese and Marie attending to the lovely bride who was stunning and her dress was spectacular. Michael was greeting their guests when I arrived at the church. Rev Kevin Doherty was the priest and it was a lovely service. The Maynooth Gospel Choir were singing wonderful pieces at the church and they really added to the ceremony. Gary Barrett was the wedding photographer on the day and as you will know his work is excellent and he is a pleasure to work with. Lawlor’s Cars supplied their car and the Minibus for the day. When we arrived at the wonderful Westgrove Hotel in Clane, we were met by Nicola who attended to their every need for the day. The drinks reception was held on the first floor were we were entertained by the Manillia Swings, a Filipino 3 Piece who were outstanding. 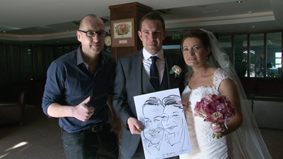 Niall O’ Loughlin Ireland’s no 1 caricatures was there doing drawings of the guests, Niall always does a great job. The sweet table went down a storm and the cake was very cool. Keying Memories were there, they took a pic of everyone throughout the day and put the picture in a key ring and this is your name place and a lovely thing to have as a keep sake. The Band was Hard To Touch and as usual they rocked the place!! It was a great day and a lot of thought went into everything and I look forward to seeing Rosanna and Michael when their wedding DVD’s are ready. 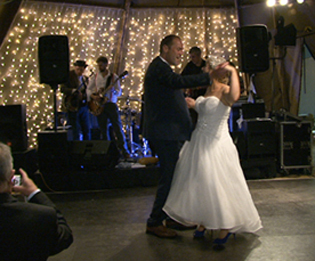 I had the pleasure of been the official wedding videographer for the society wedding of Hayley Rock and Paul Elliott on 23’rd November 2013. 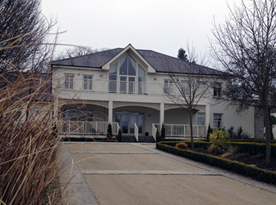 I started filming at The Kilashee House Hotel in Nass Co. Kildare were the girls all six of them were getting ready. It was a bit manic with them being models including the stunning Rosanna Davison but quite entertaining with all the usual final preparations going on. 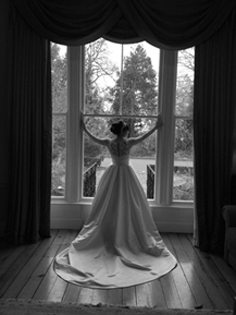 The wedding photographer was Jenny Mc Carthy and she is a very well sought after photographer in the modelling world. 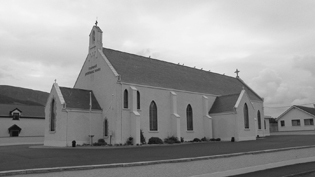 I then headed to the Church of the Lady & St Joseph in Caragh Co Kildare, it is a very nice church were we had well over 200 guests arriving for the ceremony. The celebrant was Fr. Ruairi O’ Domhniall who was lovely in both services and manner, nothing was a problem and everybody was enjoying his great sense of humour. The church music was sung beautifully by Lorna Kennedy from Musa and a very special song sung by Frank Breslin. After arriving back at the hotel we were entertained by Tropical Storm a Philippines group that entertain the crowd with there magic blends of music. 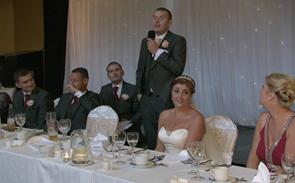 The Speeches were very humorous and the staff at Killashee House Hotel were outstanding. It was a great day and I look forward to meeting Haley and Paul when their wedding DVD’s are ready. 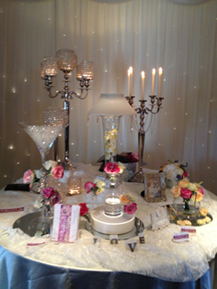 I had a stand at the wedding fair in the Tulfarris Hotel and Golf Club in the lovely Co Wicklow on Sunday 15’th September 2013, I had the pleasure of meeting several couples who were planning their wedding’s there for 2014 and 2015. There were many couples being shown around the various rooms set up to cater for all wedding occasions by the Tulfarris wedding team. There was a great atmosphere and it was a great opportunity for all the suppliers to answer any questions and queries the wedding couples had for us. 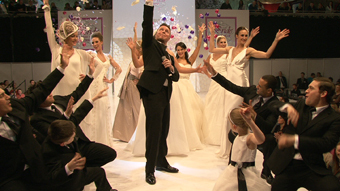 B Couture had lovely dresses for all the ladies and Neon Stephens Green were there to kit out the men. Mary from Finesse was there, I have seen some of her work over the past few years and she is so gifted in how she can turn a room into a fairy tale wedding. 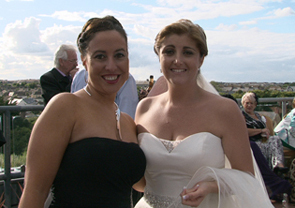 I had the pleasure of filming her own wedding a few years ago and it was lovely to catch up with her. Oasis Florist and Flowers by Enda and they both had a lovely selection of flowers to choose from. Mr Jim Schofield was also the wedding Photographer next to myself Cyril from Video Me. Lawler Chauffers were outside showing a lovely selection of cars. The wedding band Perfect Day were showing the couples there outstanding work. 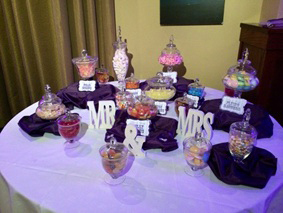 You had a choice of sweet treats, Chocolate Fountain Station and The Little Closet had some lovely treats. Tulfarris Treatments were available for any questions re hair and make up. 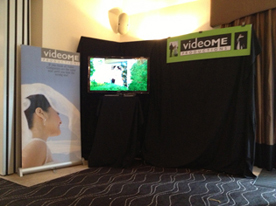 The wedding fair was a great chance to meet new couples and the other supplier in the wedding industry. 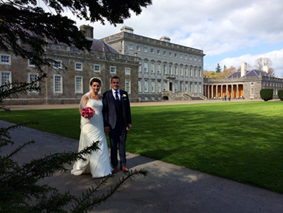 Wedding Videographer Dublin – Arlene and Aonghus – 13’th September 2013. I was the official wedding videographer up in Stradhill Sligo for the wedding of Arlene Gibbs and Aonghus Collins on 13’th September 2013. I started filming at the lovely St Patrick’s church were Fr Donal Sweeney, Fr John and Fr Niall Ahern looked after us and were very welcoming. The church music was lovely and sung by Aonghus’s dad, Mr Hugh Collins and he was joined by Geraldine Molumby and Liam Molumby, they did a brilliant job and really added to the atmosphere of the ceremony. I headed to the beach to see a few surfers doing their stuff and to add a bit of footage to compliment the wedding DVD. The drinks reception was in the lovely beach bar adjacent to Aughris beach, the wonderful Rockhouse Pilfer band entertained us all and got the party started. The wedding reception was in a teppe tent from a company in the North of Ireland called Tentip it was the most spectacular thing I have ever seen. Francis Muldoon was the wedding photographer on the day, she is by far one of the most conscientious, excellent and courteous lady you could meet. 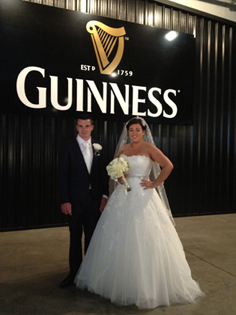 Everyone had a great day and I look forward to chatting to Arlene and Aonghus when their wedding DVD’s are ready. 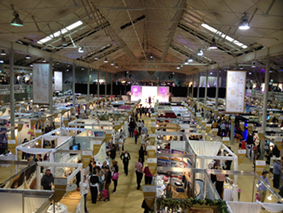 Wedding and Honeymoon Show – RDS- 7’th and 8’th of September 2013. 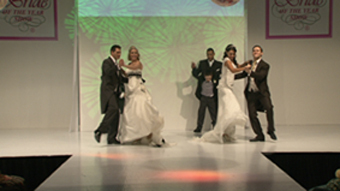 I had a stand as a Wedding Videographer at the Wedding and Honeymoon show in The RDS on the 7’th and 8’th of September 2013. This show gives couples the chance to pick the brains of all the experts in the wedding trade and hopefully get some suppliers booked. There was a great buzz around the place and there were many of the couples chatting and eating the lovely cake samples from the the lovely cake company Amazing Cakes. Some of my favorite reception venues were there, Castle Leslie, Tulfarris and also the wonderful Seafield Hotel were I had the pleasure of getting married earlier this year. A few of the wedding photographers who were there were, Fiona Anderson a fabulous lady photographer who I have worked with several times and the Burke Bros who were showing some samples of their beautiful work. 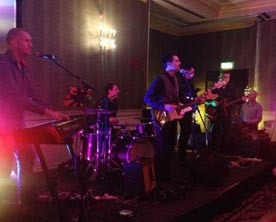 Dave Whelan from Pro Djs and the wedding band Blush were all there and not forgetting the wonderful harpist, Ann Tuite. Gabriel De Poar from De Poar designs were showing a lovely selection of wedding dresses and it was great to see Jean from Hats by Jean, who had a wonderful selection of hats for the wedding guests and the mother of the bride. There was a fabulous selection of cars from Lawlors Cars, he had the wonderful 1937 Rolls Royce. 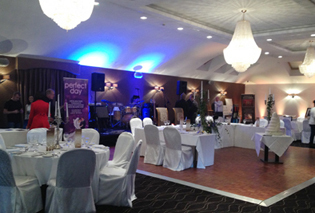 The Wedding Fair was a great chance to meet new couples and the other suppliers were impressive. 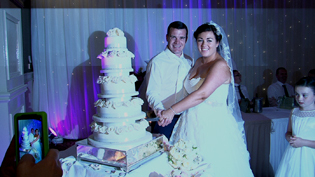 Wedding Videographer – Amy and Anthony – 5’th September 2013. I was the official wedding videographer at the wedding of Amy O’ Toole and Anthony O’ Sullivan on 5’th September 2013, and what a beautiful sunny day we had. I started filming at Amy’s house were Amy and her bridesmaids, Ann Marie, Katriona and Ashlinn were all getting the last minute touches to their hair and make up. The girls were all in good spirits and looking forward to the day. Amy arrived at the church in a lovely old fashioned wedding car called a Brenchley driven by Les from Absolute Limos. The priest on the day was Fr. Gerard Corcoran who was so helpful and a joy to work with. The church music was by Veronica O’ Hanlon accompanied by Jo O’ Sullivan and they left us breathless, they are well worth taking a look at and will not disappoint they really are fabulous. 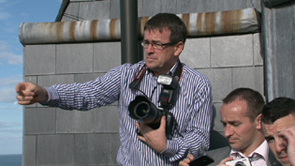 Paddy Burke from Burke Photography was the wedding photographer on the day and a pleasure to work with. The formal photos were done at the church then we went then to Ardgillin Castle with the bridal party. We headed to the wedding reception at the lovely Bracken Court Hotel in Balbriggan, were Lelia and the team awaited our arrival and looked after us for the day. The drinks reception was on the roof were we were entertained by Manila Strings it was great to see Amy’s friend Tara who’s wedding I only did in Knightsbrook Hotel in July, you can check out her wedding blog and video clip on Tara’s Wedding Blog. The staff were fantastic and the meal was beautiful. The wedding band was the fabulous Desire who kept the crowd dancing for the night. 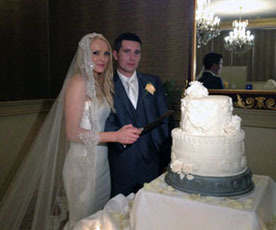 It was a great day and I look forward to meeting up with Amy and Anthony when their wedding DVD’s are ready. 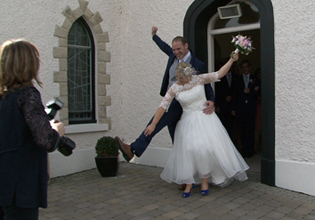 Wedding Videographer Dublin – Roslyn and Paul – 24’th August 2013. 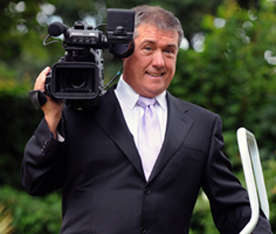 I was the official wedding videographer at the wedding of Roslyn Caffrey and Paul Kenny on 24’th August 2013. 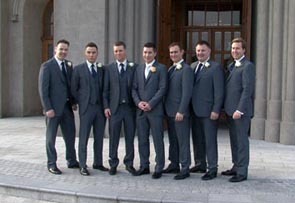 I was around with the girls beforehand while they were getting the last minute preparations done and I then headed to The Church of St. Teresa Donore Avenue, were the guests were arriving and Paul and his crew were chatting away. 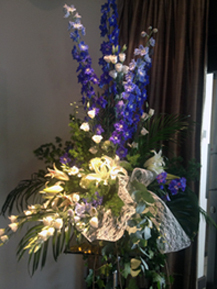 The church was magnificently decorated by Liberty Florists and Fr Sean Mc Ardle officiated at the wedding mass. 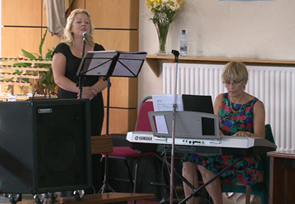 The church music was from the wonder wedding band Blush who also have a four piece choir. 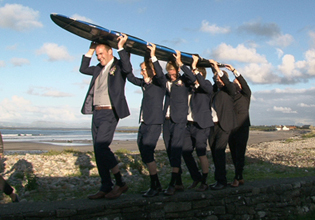 Enda, Sandra, Olivia and Denise did an amazing job and they made the ceremony so special and moving. The wedding photographer was Mr.David Frain from Frain Photo. After the ceremony we went to the Guinness Storehouse for some pictures and what a setting, we got some great shots and the interior waterfall was amazing. 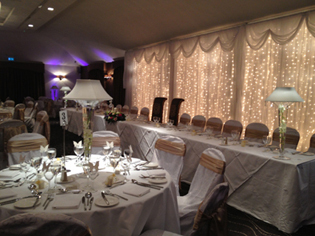 We headed to the wedding reception in Killashee House Hotel were they did a fabulous job as always. In the evening we had he wonderful wedding band Boggie Nights and they were just magical and have a great way with the crowd, if you need a band do check them out they had them rocking for the night. I look forward to meeting Roslyn and Paul when their wedding DVD’s are ready. 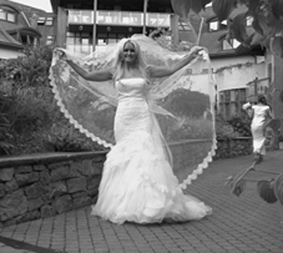 Wedding Videographer – Naomi and Damien – 18’th August 2013. 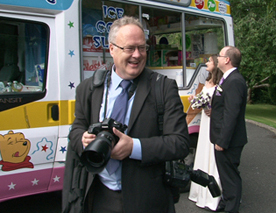 I was the official videographer at the fantastic wedding of Naomi Cooke and Damien Hughes on Sunday the 18th August 2013. 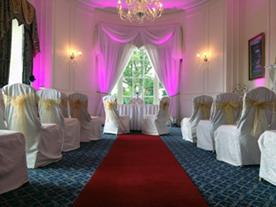 I started filming at the lovely Leixlip Manor Hotel, the most quaint spot for the most intimate weddings in Dublin. 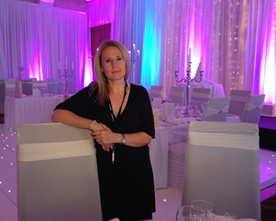 Lesley looks after the weddings personally and she always has a different touch for each of her couples. As you enter the gates and drive up the tree lined avenue of the Leixlip Manor and Gardens, you are immediately taken aback by the peace and tranquillity of the venue. The ceremony was a spiritual blessing by Tom Colton and we had a wonderful singer called Clara Rose who is normally in a gospel choir and she outshone with her singing. Clara Rose’s voice soars and swoops with the ease of an opera star running through her scales. The day had lots of sunshine, ok it may of been a bit cloudy but all in all it was lovely and we even got an ice cream from the ice cream van that attended. The wedding photographer was James Haveron from Imagemaan and he is known for his relaxed, informal and unobtrusive approach to wedding photography. 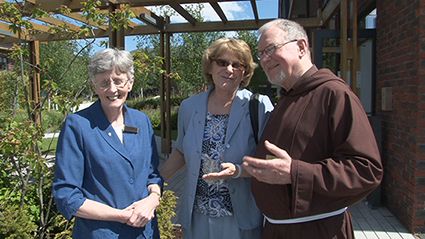 The meal was lovely and Lesley always looks after the videographers. I noticed that the wedding favours were substituted for a donation to the children’s hospital Crumlin, which was a lovely touch and such a good cause. The wedding band was called The Jones, I had not heard of them before they were very good. 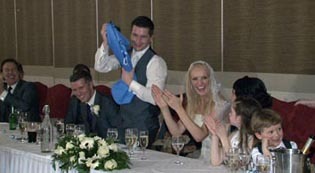 What a great day and I look forward to meeting up with Naomi and Damien when their wedding DVD’s are ready. 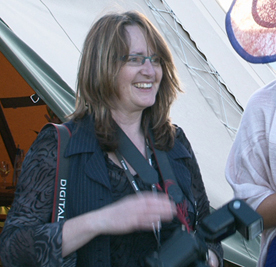 Wedding Videographer – Audrey and Damien – 2’nd August 2013. 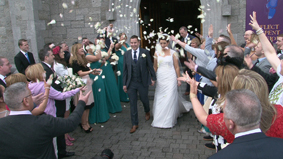 I had the pleasure of been the wedding videographer at the wedding of Audrey Roche and Damien Mulhall on Saturday 2’nd August 2013. 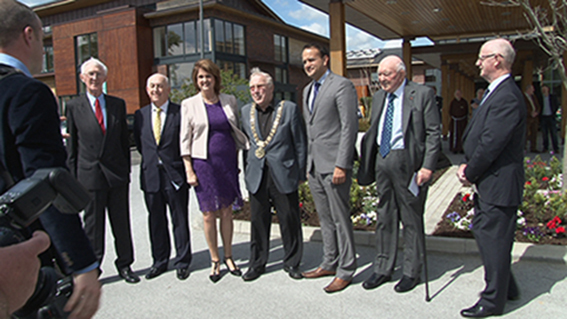 I set off to St Bernadette’s Church in Clogher Road. Linda Flanagan from Atmosphere Displays had the church beautifully decorated with trees much to the amazement of the Priest Fr Melvin. The beautiful church music was by Barbara Galvin a most sought after singer and her music really added to the ceremony. 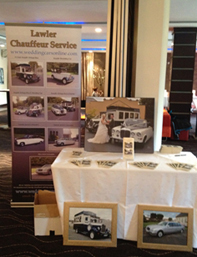 The wedding cars were fabulous, they had two Damilers from Lawler Chauffeur Services. 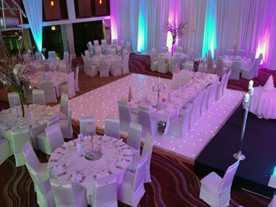 The wedding reception was held at the exquisite Osprey Hotel in Naas were the team were on hand to cater to there every need and nothing was a problem. The Hotel was magnificently decorated by Linda Flanagan from Atmosphere Displays who I had only worked with a few weeks ago. During the drinks reception they had the brilliant Mr Ken Kirwin from Frankly Bublel who was singing hit after hit from Michael Buble. The wedding photographer on the day was Pat Gorman. 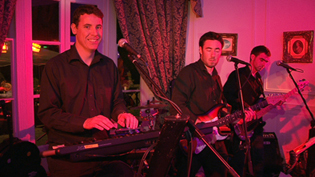 In the evening they had the wedding band Mirage who kept the crowd entertained for the night. 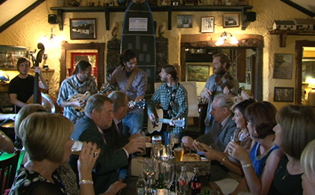 I look forward to meeting Aisling and Damien when their wedding DVD’s are ready.